Healthy baked oatmeal is always a hit in my house. It is like a muffin (and like a pudding). I talk about oatmeal a lot and have featured two overnight recipes - Crockpot oatmeal with old fashioned oats and overnight oatmeal with chia seeds. This is probably a recipe that you will make ahead. I don’t know many people who have time before work to bake for their family. You can freeze it in squares and reheat it in the microwave or just leave the tray in the fridge for the week ahead. Hot breakfast in 30 seconds!! It's like a little bit of love in a bowl and healthy baked oatmeal is customizable. You can add any fruit you may have lying around the kitchen. I used some frozen sliced peaches and blueberries because I am too lazy to slice anything. You could use apples, mangos, strawberries, pears, etc. All you do is mix it up, bake it, and store it in the fridge until you are ready to eat it. You can also cut it into squares and freeze it for individual servings. It freezes well and can be heated in the microwave from frozen. 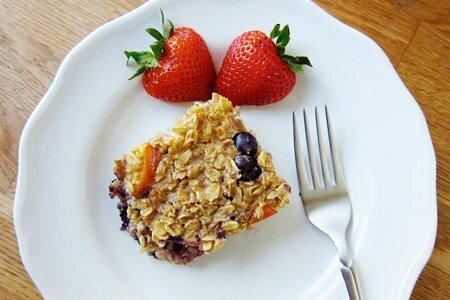 This recipe has 1/2 the sugar of most other baked oatmeal recipes. I changed it because if it isn't sweet enough for you - it is easy to just add some sweetener to the finished product. My son likes a little milk and maple syrup added to his "warmed in the microwave" baked oatmeal. It feels good giving him a hot breakfast when I am literally scrambling to get him out the door. I put some peanut butter or plain yogurt on mine because I like a more savory take. This recipe can be made gluten free if you use gluten free certified oats. Many oats are processed on the same machines as wheat so you have to be vigilant when purchasing them. Do you make baked oatmeal? What do you put in in it? Preheat oven to 350F. Spray nonstick spray on a 8x8 baking dish (or equivalent). Mix oats, baking powder, baking soda, salt, allspice and cinnamon. Add fruit, milk, plain yogurt, eggs, and syrup and mix. Spoon into baking dish and cover with foil. Bake for 20 minutes, remove foil, and bake for another 25 minutes until golden brown. Enjoy hot, cold, or room temperature. If well covered, this will keep in the fridge for one week. I LOVE the idea of a microwaved oat cake! Quick breakfast fixes like yogurt sure don't sound good on a chilly morning. Ooooh, I'm going to try to make this with 2 cups almond milk (to replace the milk & yogurt) and flaxseed "eggs"...thanks for the idea! This looks fantastic! In college I used to buy that Quaker Oat squares that tasted pretty good (but have awful ingredients). This substitute looks much tastier anyway. I've been wanting to make baked oatmeal for a while, so once i finish eating my crockpot full of steel cut oats, i'll try this! I might use dried fruits so it doesn't get soggy during storage in the fridge. This sounds easy and delicious, can't wait to try it! Thank you! I'm so excited to try this. I was just telling my husband this morning that I need to find more breakfast items for the kids with protein. I love this idea of a "make-ahead" oatmeal that I can pack for my breakfast at work. I don't like the packaged "bars" which all have way too much sugar. This sounds great! ooooh this seems very simple! Quick question though, while i'm fine with eggs, my housemate's vegetarian and can't do eggs (though milk I think is fine), is there anything I can use to replace the eggs? Or can I just forgo the eggs altogether? also, can I use plain greek yogurt in this recipe instead of regular yogurt? I have plenty of cartons of greek yogurt (love this stuff mixed with fruit!) and really don't want to go buy regular yogurt separately (especially if it comes in too large of a container and i won't be able to eat the rest of it). thanks~ love your blog and all these awesome recipes! and it worked great! you need something to bind the oatmeal together. Thanks for your question! Thank you for the wonderful idea. I always found oatmeal gelatinous and hard to eat- this sounds delicious! I'm trying to cut out as much sugar as possible, so plan to try this with an artificial sweetener. One of my problems with breakfast is that yogurt - even plain yogurt - has a significant amount of sugar. Does anyone know of a yogurt brand or substitute that has, say, less than 5g of sugar per serving? I want to say that I love this site and I really like this idea. I replaced the milk with unsweetened vanilla Almond breeze and used half maple syrup 1/2 brown sugar.I spooned the mixture into a muffin pan instead of a regular pan. I also put apples in half and cherries(this is way better than traditional apple/cherry pie!) on the other half. I think next time I will try it with bananas for a banana bread like treat. I would probably be having this with almonds for extra protein. I just made this it turned out delicious. I used 1 cup of unsweetened Almond Breeze for the milk, I used 1/2 cup egg beaters for the eggs and 1/4 of cup Whey Low Brown Sugar for the sugar I also used 1 1/2 frozen mixed berries for the fruit. I did cook it 10 minutes longer probably because of the frozen fruit. It was so good. I added a little fat free whipped cream on top. It came out to 2 WW points per serving on the old plan. I put it in the recipe builder on MY FITNESS PAL. what's the serving size per person? and is this oatmeal or oatmeal bars? thanks. is this oatmeal or oatmeal bars? because the picture looks like bars. What?! 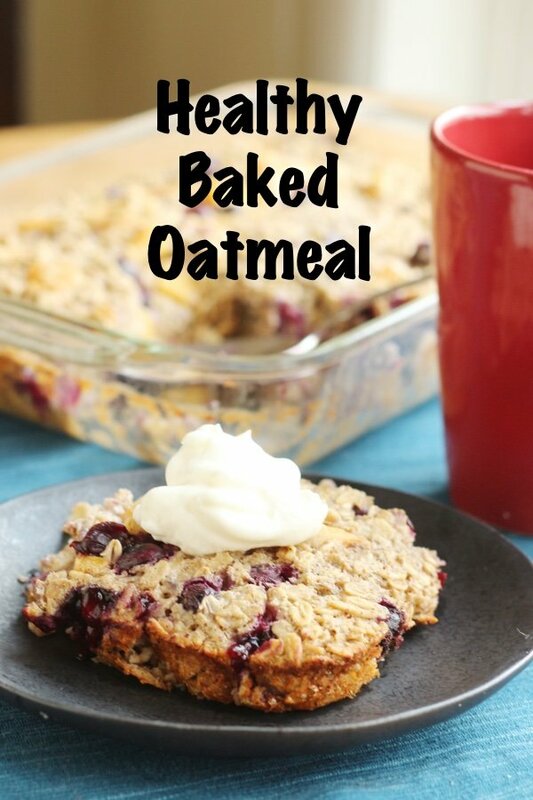 I can't believe you've never had baked oatmeal!! It is about one of the world's best things ;) you can even use pumpkin. @Marisa: The serving size is 8 people, so 1/8 of a recipe. And baked oatmeal is like regular oatmeal, but baked. If you make it in a thin pan (like a cookie sheet with sides) then MAYBE they'll be bars :P really, really crumbly bars. Thanks for researching this and giving us the recipe. it sounded so good when that reader talked about it,I eat Oatmeal with fruit every morning for breakfast. I am making this tommorrow morning, cept I think I'm going to use egg beaters instead of whole eggs. Hi Snack Girl, I love your daily emails. As an ex-Weight Watcher leader I appreciate your approach to healthy eating. I hope you won't get in trouble with WW by putting the points values on your recipes - during my time with them they sued Healthy Choice and others for using their proprietary points values! Don't want you to get into trouble. Keep up the good work. @Elizabeth - I talked to them about using PointsPlus values and they said it was okay with them. I don't think I am in any trouble. 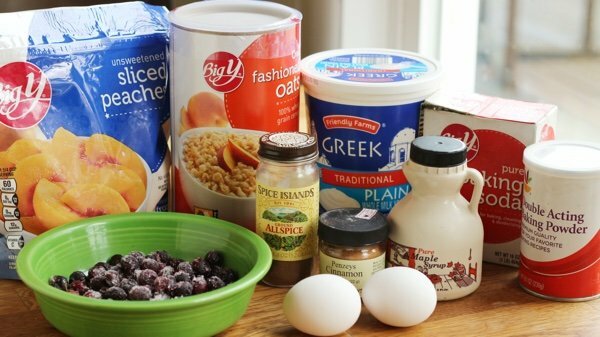 Hi, I found a new website with a daily blog about healthy eating, including LOTS of delicious oatmeal recipes. Snack Girl, I think you and Kath are on the same wave length - she takes pictures of what she eats and put it on her blog - really great healthy ideas. I totally make baked oatmeal all the time. Make it on Sunday, package into individual containers, and I have breakfast for the whole week. I add chopped walnuts and/or ground flaxseed as well for added nutrients and protein. So glad you discovered this! I made it this morning and used egg beaters and agave. I also had larger sizes by cutting it into 6 pieces, which have 5 points plus. This is so awesome, it is like having dessert for breakfast. I've just made mine and it turned out delicious! It's a little dry inside ( it's suppose to?) but very delicious! Is there any way to make it crunchy, like bars? I made this on Monday and it tastes better by the day! Even my super picky 4 year old likes it. I like it best cold and he likes it warmed with a little drizzle of maple syrup on top. I used to eat protein bars for snacks and now I'm going to eat this instead. I have made 2 batches so far....love, love, love this idea for a healthy breakfast on the run! Great suggestion as usual. I will add this to my Making a Life Change nutrition plan! I substitute splenda or sugarfree syrup and I use eggbeaters. Today I made 2 of them to share with aging parents. I put one cup canned pumpkin, blueberries and mangos for the remaining 1 1/2 cup fruit. The other one I used bananas and fresh rasperries, oh yes and I used Watkins nut flavored vanilla. This are both so good I eat them as an afternoon snack or dessert at night with a dollop of free cool whip. Is the baking powder and soda necessary? @Ginger - I would think probably not. I didn't try it without them but I bet it wouldn't change a thing. Great question! @Jenn - 1 inch by 1 inch - a large cookie is the right serving size. I would eat 2 for breakfast. Thanks for your question! Hi, I have been making this (and making it my own) for 3 weeks now. The biggest tweak I've put on it is to bake it in a muffin pan. The receipe makes 12 perfect pucks. I don't add the baking soda or baking powder (oats don't rise without flour) and I add maybe a tablespoon of maple syrup because it is easier than honey. The two chopped apples provide all the sweetness I need. I ran it through the WW receipe builder and 1 puck is 3 points. I put a puck in a bowl, chop it up with a spoon and pour in some milk and nuke to heat it up. Hot and tasty. 2 pucks on a hungry day with hald a cup of milk is 6-8 points (depends on your milk choice.) Enjoy. Do you need a spoon to eat this or is it finger food??? I am hoping it's more like a muffin type consistency!! @Theresa - it is on the edge of a muffin consistency - I use a fork to eat it - but my son uses his fingers. If you cook it a bit longer it may be less mushy. Thanks for your question! Thank you SnackGirl! This baked oatmeal is fantastic. I eat it at work with my morning tea and my husband pours yogurt over it after his daily workout. Wooooo Hooooo. Subbing light sour cream for the yogurt worked fine for me. @jen209 you might try that if you can't find a low-sugar yogurt. Great recipe! Hey love the recipe. I was wondering if you knew of a way to get more protein in this thing. I was thinking of adding a couple scoops of my protein powder but not sure what to add to make it not be dried out. @Josh - why not add a few egg whites? That will work, I think. Thanks for your question! I just came across this recipe. I'm the only one that eats oatmeal. Do you know if you could freeze this or somehow preserve it so I don't have to eat it daily? Do you know if these can be cut into squares and frozen? I would have a hard time eating this up in a week. Easy and delicious! Thanks for the recipe. Wow, this looks delicious! I can't wait to try making this. @SusieQ - yes, you can cut this into squares and freeze it. It will freeze well. Thanks for your question! I substituted plain Greek yogurt for the regular yogurt and it came out to 4 smart points per serving. I’m going to make this. What fruit did you use? Thank you so much for this recipe. It looks delicious. With Greek yogurt the recipe came to 4 smart points per serving. I will definitely make this. What fruit did you use or recommend?